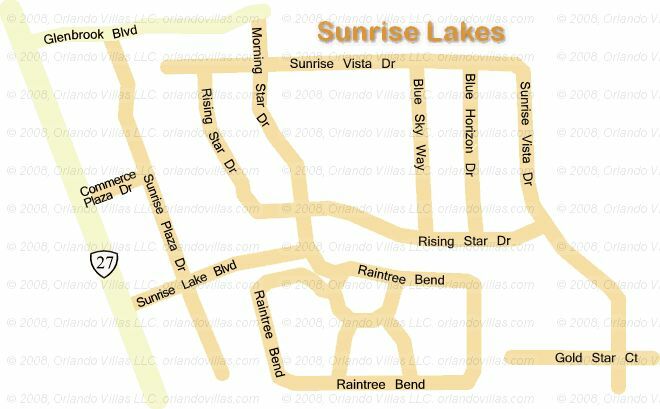 Sunrise Lakes is one of the newest and nearest Communities to the wonderful Disney Complex, just 10 minutes drive. Whilst for the golfers the Championsgate Golf Course is just a few minutes away. Only half-a-mile away is a large Wynn Dixies supermarket, Post Office, ATM’s and just across the road is a Gas Station, whilst the lively 192 highway has all the shops and restaurants you could ask for. 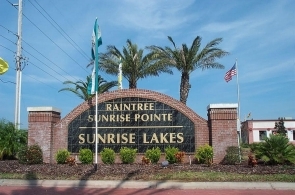 Sunrise Lakes is an exclusive, quiet community, very well maintained, with a mixture of permanent residents and holiday homes, just 1 mile from the 192 on the 27 heading North. A communal pool and children’s play area are soon to be added. A large Walmart, due for completion Nov 2004, will be just up the road for every conceivable shopping requirement, making this the complete Community for the Florida Vacation destination. Access to the Interstate 4 is also very convenient, leading to Universal Studios, Islands of Adventure, The Florida Mall, Kennedy Space Centre and the wonderful beaches of Clearwater, St.Pete’s and Cocoa Beach.